When it comes to branding Nashik, one cannot miss to mention its very famous Chivda. And when it comes to Nashik chivda, one cannot miss on to talk about Madhavji chivda, which is serving the Nashikites for more than 85 years. Started by three brothers – Madhavrao More, Murlidhar More and Raghunath More in 1925, Madhavji Chivda traces back its origin in Mumbai. “It was my grandfather and his brothers who started this business. Though they were originally from Nashik, they used to sell this chivda outside the Brabourne stadium in Mumbai during the India – Bangladesh matches. It soon became popular. Ex-minister Vyankatrao Hire was my grandfather’s friend. He suggested selling chivda in Nashik. This is how Madhavji Chivda was introduced to Nashik,” shares Nilesh More, who the third generation selling Madhavji Chivda. However, it was the Gujarati customers who advised to rename the chivda as “Madhavji ka badhiya chivda”. Today, 85 years and two generations hence, Madhavji Chivda has five outlets in Nashik at Panchvati, M.G. Road, Ravivar Peth, Ram Ghat and Nashik Road as well boasts over 75 counters across Nashik. Also, the Chivda is distributed all over Maharashtra. 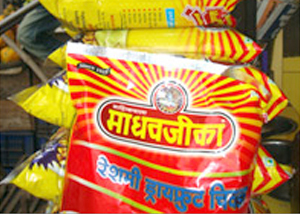 Recently, Madhavji Chivda has gone global by exporting the Chivda to Dubai. 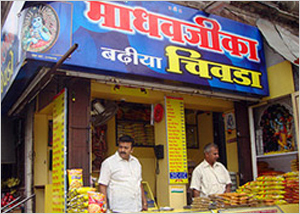 Madhavji Chivda boasts 75% Mumbai consumers as their customers. The daily production of Madhavji Chivda is 1000 – 1200 kg per day. The entire process is mechanised and all the packs are foil packed in foodgrade material after the nutrient values are checked properly. The new generations have innovated new types and kinds of Chivda. Today, the available variety includes different types of Chivda, mixed dal, Bhadang, Math, etc. More dedicates the success to the secret of the masala that they use while making chivda. “Using branded material helps a lot in maintaining the quality”, More shares. How to reach to Madhavji Chivda store: If you would be coming by train the nearest to you will be the Nashik Road outlet. If you are coming by the bus, the M.G. Road outlet or CBS outlet is very near to you. If you are in the heart of the city, the Main Road outlet or the Panchvati outlet would be closeby. What to shop for: You can choose from array of Madhavji Chivda variety. Also, Vijay Bhel is a must buy!